by Bill Dwight on Friday, August 24, 2012 at 11:04 AM | LEAVE A COMMENT! Been a while (a year in fact!) since the last installment, but it’s baaaack! Are you inadvertently sending any of these 8 money messages to your child? It’s interesting to consider how you’re handling each. Sometimes it’s just a matter of taking a few moments to explain or show what’s going on to your youngster. 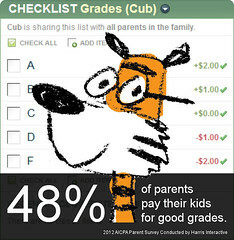 A recent AICPA survey of parents with kids in school shows 48% of them pay their kids for good grades. Are you surprised by the size of that percentage? Check out the other highlights from the survey here here. Are you a frugality mentor to your kids? Anyone else remember Green Stamps? (See number 17 on the list.) Loved those! I always remember my Dad comparing price per ounce in the market. You? We’re constantly scouring the Internet looking for articles related to family finances and teaching kids good personal finance habits. You can visit our ever growing list of family finance bookmarks here. We’re up to 2,807 now!